Choosing from the submissions--Curators CHIEDZA PASIPANODYA and JORDANA FRANKLIN at Walnut Studios, as part of the OCADU Women's Kit mentorship project. 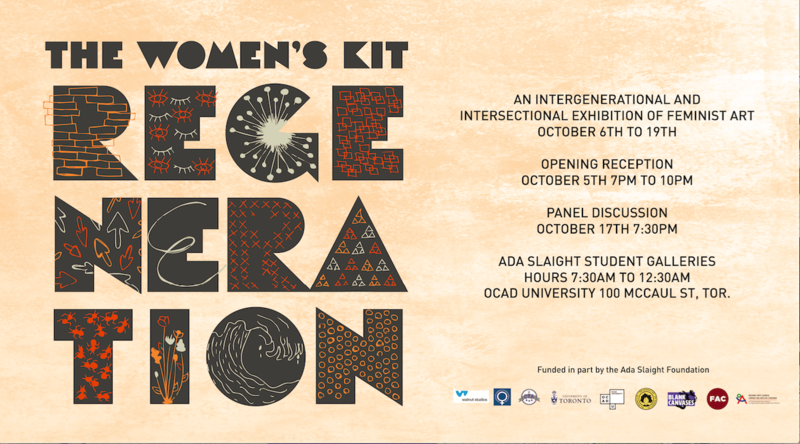 An intergenerational art exhibition and launch of The Women’s Kit website celebrating the history and visibility of feminist art in Toronto. In 1973, The Women’s Kit was produced in Toronto at the Ontario Institute for Studies in Education (OISE) by researcher and artist, Pamela Harris, along with a team of fellow artists and educators. These women assembled a dynamic educational resource with over 150 items that relate to the socialization of femininity. The Women’s Kit was distributed to high schools and colleges to encourage students to observe and question the limitations set on prescribed gender roles. Since its creation, The Women's Kit has found its home at the Centre for Women's Studies in Education (CWSE) at OISE as a subject of research and scholarly publication. 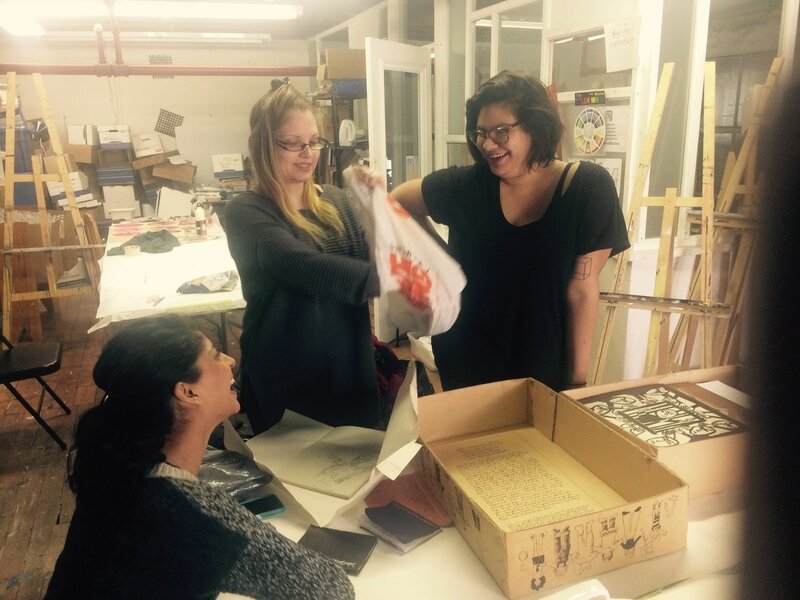 During a meeting in 2014, members of the Feminist Art Conference viewed the kit and were enchanted by the time capsule of the feminist art movement in Toronto. Through funding by an anonymous donor and hundreds of volunteer hours, they sought to immortalize the kit through a massive digitization project. FAC is strongly motivated by a feminist imperative to document the pioneering work of the kit’s creators. This new website is as a testament to the importance of feminist history and the necessity of visibility. By publishing The Women’s Kit online, FAC is bridging the feminist generation gap. The creation of the digital platform also allows the kit to return to its origins as an educational tool for wide dissemination. For the development of the website, FAC procured funding from a generous anonymous donor. The educational expansion on the project solidified with additional funding from OCAD University through the Ada Slaight Foundation and an Arts Education Projects grant from the Ontario Arts Council. This critical funding supported students in an exploration of the kit, culminating in the creation of artwork inspired by its contents. Outfitted with museum gloves, current Drawing and Painting students at the Ontario College of Art and Design University, along with recent alumni and local youth, dug through this rich archive responding with contemporary viewpoints on feminism today. The resulting exhibition, REGENERATION, seeks to provide an in-depth and intersectional approach to The Women's Kit, one that re-examines several critical conversations rooted in generations of feminism and fertilized by LGBTQ2S+ love, afro-futurist narratives, race politics, diasporic conversations, gender identity and sexual diversity. They explore new feminist realities and amplify artist narratives that were silenced at the time of the kit’s inception due to power and privilege at play. The arts-engaged youth do this through printmaking and zines inspired by pop art and the graphic arts movements contemporary to the kit. The resurrection of the kit at this critical moment in the feminist movement and the ensuing conversation between past and present culminates with the launch of The Women’s Kit website and the REGENERATION exhibit of new artwork created by a current generation of storytellers. Join the conversation through art and explore The Women’s Kit website at the opening reception on October 5th! Cash bar and party snacks! Supported by Ada Slaight funding through OCADU’s Drawing, Painting and Printmaking Department, this project includes an open call to all DRPT/PRNT students in third and fourth year to create new work in response to the social justice themes communicated in the Women’s Kit. Students will explore the kit’s visual and auditory artifacts for points of art-making. The unique aspect of this project is the intergenerational conversation between feminist art-making practices in the 1970s and contemporary practices at OCADU. At the end of the process, the students’ work will be shown in conjunction with the Women’s Kit to create a visual dialogue between both periods. The current political climate, particularity with the regressive, pervasive politics of the Trump administration, is a catalyst for the students to create work in response to this critical moment in time. 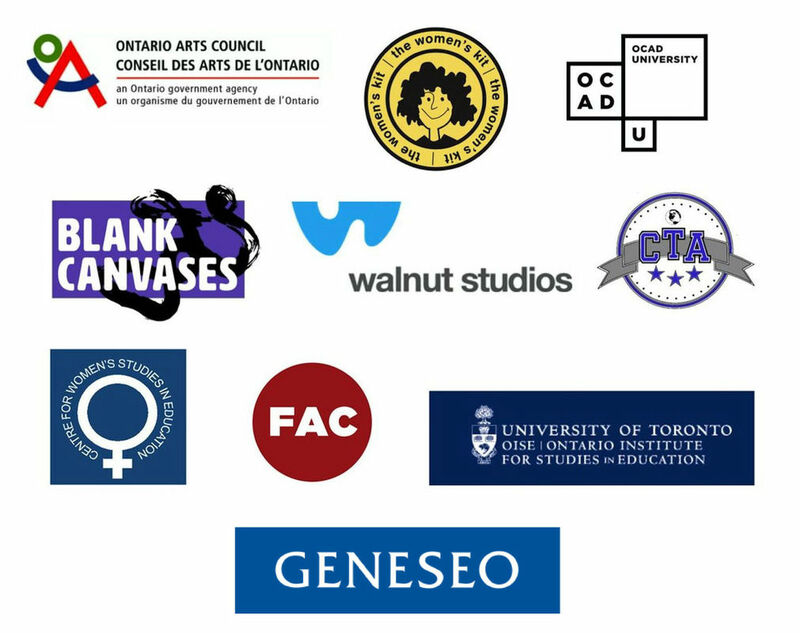 Through this project, OCADU will be able to provide paid professional opportunities for students. The students will be mentored through installation design, exhibition marketing and promotion, and curating a panel discussion. Funded by the Ontario Arts Council Arts Education Project grant, The Women’s Kit will provide young people from Central Toronto Academy, a model school with an at-risk student population, as well as other local Toronto youth, with the opportunity to explore feminist issues as they present themselves in historical and contemporary ways. The students will examine artifacts from the kit as windows into the past, mirrors for the present, and opportunities for a better future. Learners will have the chance to investigate the issues, and respond through art making, dialogue, and reflection. In the process of creative expression, learners will make meaning of the contents of the Women’s Kit that is personal, useful and inspirational. Youth will explore printmaking, zine-making and bookbinding, as artistic vehicles to explore their ideas around the kit. This work will be shown with the OCAD University Student work in an exhibition at OCADU FALL 2017. See photos for this project here. Photography by Maiesha Zarin. A brief Education Guide to navigating the Women's Kit was developed by Julia Girmenia and Noorin Fazal. This series of questions is meant to help kickstart conversations about its content. Check it out here.